» What Makes Spending Manufactured? The phrase “manufactured spending” gets thrown around a lot in the world of travel hacking, but what does it really mean? That question may sound like we’re about to have a psychological discussion that’s much more complicated than it needs to be, but I promise we’re not. The purpose of this post is to differentiate regular spending and manufactured spending, because far too often, I see them become synonymous when they aren’t. Let’s break that phrase down. Based on Merriam-Webster, manufacturing is “the act or process of producing something.” And spending is “to pay out (money).” When you put it all together, manufactured spending is “the process of paying out money to produce money (in the form of cash, points, or miles).” In other words, it’s a business transaction. Manufactured spending is the process of buying cash equivalents (e.g. gift cards, money orders) with credit cards to earn points, miles, or cash back. Those cash equivalents are then turned back into cash via a variety of liquidation methods. That description may sound like a perfect system, but there’s one caveat. The cash equivalent purchased usually comes with small fee that can range from a few cents to a few dollars. For example, let’s say you have a credit card that earns 1X points. If you go to the store and buy a $500 gift card with a $3.95 fee, you’ll earn 504 points. Assuming you liquidate that gift card with no fees, you’ll have spent $3.95 for 504 points. That works out to 0.78 cents per point. Even if you get 1 cent of value out of each point, that’s a good deal. Hopefully, though, you’ll get much more value out of those points. Quick Note: Chances are you already knew the answer to this question before I even explained it. If not and you want to learn about manufactured spending in-depth, you can do so here. That’s the manufactured spending we all know and love, but there’s so much more too it. Manufactured spending is not just prepaid cards and credit cards. It’s also portals and reselling. It’s rebates and rewards. It’s everything that involves spending money to earn money. What it’s not is money laundering and regular spending. As similar as money laundering is to manufactured spending, I can assure you it’s not the same. Money launderers may use some of the same techniques, but the difference comes in the “cleanliness” of the money. Manufacturing spend with dirty money, which is money laundering, is illegal. Manufacturing spend with clean money is 100% legal, because it’s your money and all you’re really doing is moving it around. In addition to not being money laundering, manufactured spending is not the same as regular spending. It seems like they are commonly confused, but we’re going to stop that confusion today. Again, this may seem like an obvious question, but I feel compelled to explain. Spending is the process of using money to purchase goods or services. Simple right? You’d think so, but far too often people outside of the points and miles world confuse the two. Spending is not manufactured spending. Manufactured spending uses the term spending in a sense that you’re purchasing $3.95 worth of points, miles, or cash back. However, running up credit card spend on regular purchases (e.g. groceries, movies) does not constitute manufactured spending. Neither does purchasing a gift card for a friend. 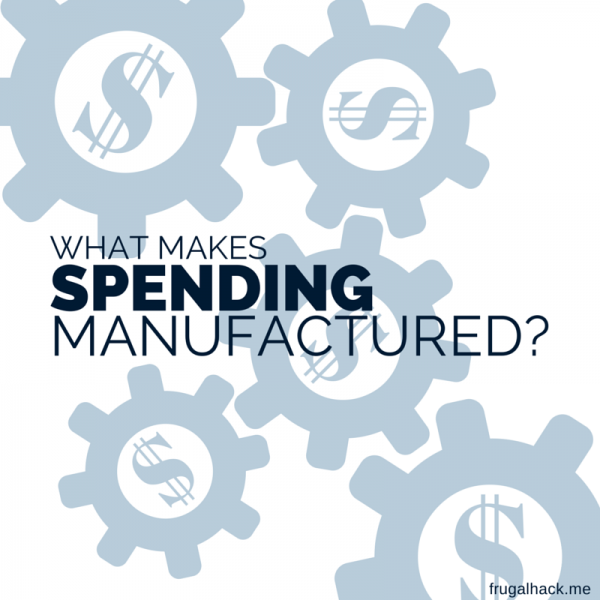 Manufactured spending is often confused for regular spending. Why? Because earning rewards with a credit card has been categorized as MS when it’s not. Manufactured spending is the process of spending very little money to earn the most points, miles, or cash back as possible. Spending is the process of buying goods and services. The rewards earned from regular spending using a credit card are just byproducts of spending. The manufactured part only comes into play when you buy something you plan to liquidate by selling (reselling) or cycling (MS). Is this post necessary for everyone to read? Absolutely not. It’s written for the person who says, “I do that too!” after explaining to them the general process of manufactured spending for the first time.